December 2014 will combine two events in the Cloud Plugfest series, as described below. The location for the Friday portion of the event is the Hilton Metropole at the corner of Praed Street and Edgware Road, just down Praed Street from the Hilton Paddington Station, which is the site for the UCC 2014 event. Click this link to jump directly to the event schedule. December 8-12, 2014 virtual Cloud Plugfest - online participation through tools offered on this site. December 11, 2014: interoperability demonstrations in person at the Utility and Cloud Computing Conference (UCC 2014), London, UK (Location: Redstar and George V rooms). December 12, 2014: interoperability demonstrations continue in person at the same venue (Hilton Paddington), London, UK (Location: Thames Suite). Presentations made during the Thursday and Friday Interoperability Demo Days will be recorded professionally and at the presenters option will made available through Primeur Magazine and the CloudWatch project sites. ALL PROJECTS AND SOFTWARE PRODUCTS FEATURING SIGNIFICANT INTEROPERABILITY ARE INVITED TO PRESENT AND HAVE THEIR PRESENTATIONS RECORDED AT THIS EVENT! Registration and further information is available at this link. Registration is REQUIRED to attend either of the in-person days or to participate in the virtual Cloud Plugfest. If you plan to participate in-person for the sessions to be held Thursday as part of the UCC event in London you must also register for the UCC 2014 conference. At minimum, a conference day pass is required to attend the Thursday session. Beyond this, no additional cost is associated with the Interoperability Demo Days and Cloud Plugfest event. 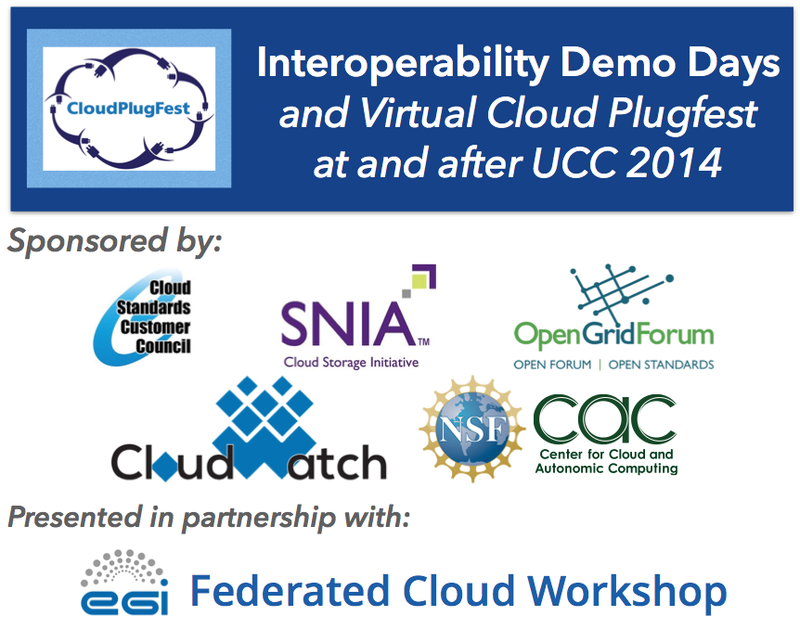 Further Interoperability demos, Cloud Plugfest wrap-up sessions from the previous week and a planning session for further events in this series will take place Friday, Dec. 12, continuing at the same venue after the conclusion of the UCC conference, which ends Thursday. UCC registration is not required for the Friday sessions, which are also offered at no cost through the generosity of our event sponsors. Registration using this form is REQUIRED in order to participate in the Interoperability Demo Days and/or Cloud Plugfest. Remote participation in the virtual Cloud Plugfest this entire week is available at no cost upon completion of the registration form. It is not necessary to present a talk at the event to register; audience participation is welcome, but registration is required to attend in either case. Note: The event allows pre-release products to be brought by any party, at their option covered by a one-year non-disclosure agreement if needed to get the latest material into view. This is rarely enforced, but we do want to encourage all products and projects, including those that need such agreements, similar to those used in roadmap presentations by hardware and software vendors. To register, first read the terms outlined in the Confidentiality Agreement, then complete the electronic registration/acknowledgment form below. This agreement does not restrict any party or participant from presenting their own work in the Cloud Plugfest or interoperability demos and simply increases the range of presentations that can be viewed at the event. If you have any questions or need further assistance, please contact info@cloudplugfest.org. Filling in the form will register you for the event.